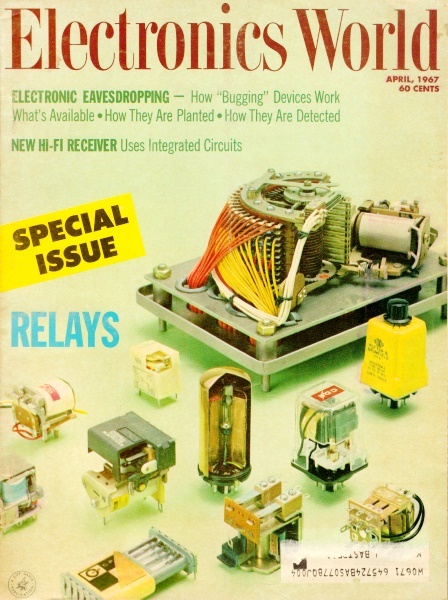 Even though this article was written more than 40 years ago, the fundamentals of protecting relays against interference from either internally or externally generated noise haven't changed. Sometimes a datasheet will recommend protection and noise suppression techniques, and when that is that case, the manufacturer's advice should be followed (unless you have a really good reason to deviate, possibly voiding a warranty). When you find yourself on your own with the design, use this article and the very comprehensive table of application examples. By R.M. Rovnyak* / Staff Engineer, Product Design Section, Automatic Electric Co. When relays are used. in switching circuits, conducted and radiated r.f. interference as well as contact erosion may occur. Here are some of the techniques that are employed in order to minimize these harmful effects. This article will discuss the suppression of interference associated with a relay. The entire system contributes to the noise problem and all factors such as grounding, shielding, bonding, wiring and component layouts. and choice of inter-system connection points must be adequately engineered to minimize noise. 1. Develop voltage and/or current transients of sufficient magnitude to damage or destroy components within the system, rendering it inoperable. 2. Produce unwanted disturbances which can cause circuit malfunction either within or external to the system. 3. Decrease the useful life of the system and its reliability by, excessive wear and tear on its components. The high-magnitude transients are associated with breaking inductive loads such as the coils of relays. The problem is most severe when the inductor is rapidly switched to the "off" state. Under these conditions the voltage can be very large and is of opposite polarity to the supply voltage. This presents a hazard to polarity-sensitive devices or it may initiate a high-energy discharge across a set of contacts or the insulation between windings on the coil or elsewhere. Load switching may also generate coincident parasitic disturbances or RFI (radio-frequency interference). This broad classification spans a frequency spectrum of about ten decades and can be classified into three types: induced, conducted, and radiated. The bandwidth associated with these are approximately: induced - 10 Hz to 106 Hz; conducted - 103 Hz to 108 Hz; and radiated - 104 Hz to 1011 Hz. Disturbances by conduction are derived from such things as dynamic regulation from the supply or down the line within the system, loop imbalances, recirculating currents from inductive loads, and poor connections. They are not particularly associated with anyone type of load but are more dependent on the magnitude of the current being switched. Such disturbances are minimized by applying good techniques in inter-circuit connections, component layout, wiring practices, and the proper choice of hardware. Inductive coupling between circuit loops or between an inductor and a loop can result in more than sufficient energy to cause circuit malfunction. Careful analysis of normal circuit current paths will pinpoint the need to either inhibit the source or minimize the pickup. Physical isolation between source and susceptible pickup points and the use of twisted-pair leads to reduce the area included within the loops are the principal cures although magnetic shielding is frequently required. Arcing which occurs upon both make and break of a load by a set of contacts is a source of radiated electromagnetic interference. All load types (R, C, L) with open-circuit voltages above about 12 volts can initiate an arc at the contacts. This occurs in relay circuits as opposed to semiconductor switching. Suppression of some sort is required, the type depending on the load. The objective is to prevent or minimize the energy in the arc. The final area of concern is the erosion of the contacts. We first choose a contact material which is optimum for the load and limit the arc energy by the application of suppression elements. If we put a series RC network across the contacts and make R small, the impedance under the transient condition may keep the switch voltage (which includes applied and self-induced voltages) small immediately after the contacts break. This arrangement is preferred for most inductive loads, the contact voltage at the instant of opening being limited to ILR, where IL is the load current just prior to the break. In the case of the load being substantially removed from the switch, however, it may be best to suppress at the load unless the sole objective is to prevent contact erosion. Two other factors associated with inductive load switching are interwinding capacitance and magnetic flux leakage. The capacitance is effectively in shunt with the coil and will draw high, short-duration charge currents. It is occasionally necessary to include a small inductor or resistor ahead of the load to limit the surge. The leakage flux will induce a voltage in a coupled loop and, if intolerable, magnetic shielding must be used. Capacitor in-rush currents must be limited to reasonable values or high-energy arcs will be sustained on contact closure. Intense RFI will be generated unless the contacts weld first. Capacitive loads per se are routinely taken care of in the design; however, lead and winding capacitance, often overlooked, can play havoc with a system susceptible to such occurrences. With any type of suppression scheme it is necessary to first establish the main circuit suppression requirements - such as to protect a solid-state device, minimize contact erosion, etc. - before deciding which technique represents the best compromise. Table 1. Various suppression techniques used in relay circuits along with comments on their general characteristics. The selection of a suppression technique depends on the objectives to be obtained and the price one is willing to pay. The objectives can be categorized in three main areas: protection of components from destruction or abuse due to the transient; reduction of the erosion rate of the contact to increase the useful life of the contact; and reduction of the disturbances produced by switching a load. The relative ease with which each may be accomplished is in that order and, as a general rule, one that satisfies the more difficult requirement will also take care of the less difficult ones, e.g., a suppression scheme that inhibits RFI will also provide long life and protect associated components. The price paid for achieving the required degree of suppression may be anyone or more of the following: cost including component and installation; more power consumption; increased space or weight requirements; or longer release times, in the case of relays. The circuit designer should approach the selection of a suppression technique by: first, deciding the objective; second, determining the effectiveness of the various techniques to accomplish the objective; and finally, resolve the best technique, based on a trade-off in parameters, including the reliability level of the suppression elements themselves. 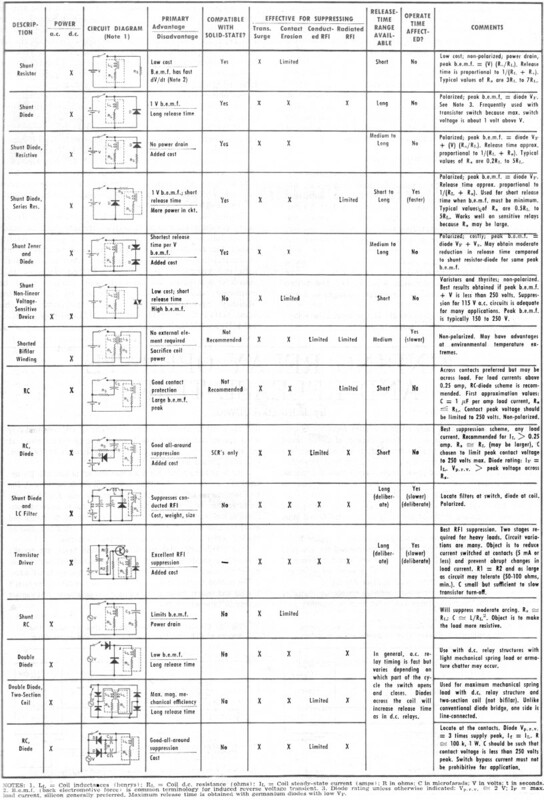 Table 1 shows various suppression techniques used in relay circuits, with comments on each regarding general characteristics. It should be pointed out that, except for meeting elementary objectives, the final determination of values and suppression schemes is empirical. Evaluation of suppression is a two-phase operation, observation of the transient magnitudes and degree and nature of the arc and then testing under operating conditions for the performance characteristic desired. A fast oscilloscope and a probe that does not load the circuit are required to observe the transient and arc. A small resistor, suitably located, may be needed in order to observe the current in some circuits. The nature of the load characteristics will determine the approach and interpretation of the results to arrive at the most suitable suppression scheme; i.e., the prime factor in an inductive load is the surge voltage, in a capacitive load it is the surge current, and in an arc it is its power level and energy content. If the load is a relay, the effect on timing may be important. A common method of measuring this effect is to trigger the scope at the instant the coil is de-energized either from the decay slope of the energizing pulse or the induced transient and measuring the time until contacts change state by displaying the voltage drop across a resistive load switched by the contacts. It is good practice to use a dual-trace preamp and to display the trigger because false triggering can lead to confusing results. Switching electromechanical devices with semiconductors presents no particular hazard if the transient voltage, current, and time dependency (dV/dt rate in the case of an SCR) are maintained within rated limits. Three basic things should be kept in mind: 1. The peak voltage across the switch is the static off-voltage plus the transient peak when the suppression is across the load. 2. The peak turn-off current will be the load current at time of switching. 3. The decaying current must recirculate decaying to zero, and will seek the part of lowest impedance which should be, by design, the suppression elements. Testing the effectiveness of RFI suppression involves a fairly complex approach. Relative estimates can be made for conductive disturbances by monitoring with an oscilloscope, for radiated interference by observations of arc characteristics, and the coupling interference must be built into the circuit as previously described. 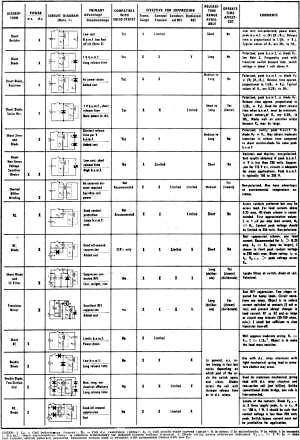 Beyond this, standard apparatus and measurement schemes must be employed, and the reader is referred to the following Military Specifications for further guidance in this area MIL-I-26600, MIL-I-6051C, MIL-S-10379, MIL-I- 11748B, and MIL-I-6181D. *The author is a 1961 graduate of Indiana Institute of Technology with a B.S.E.E. degree. His efforts have been in design and development af electro- magnetic switching devices. He has published several papers on related subjects and holds one potent, with another pending.